Royal Jelly is a substance that is secreted by nurse worker bee glands. This royal jelly is the primary food for the first three days of life for bee larva. The queen bee is fed only royal jelly for her entire life. 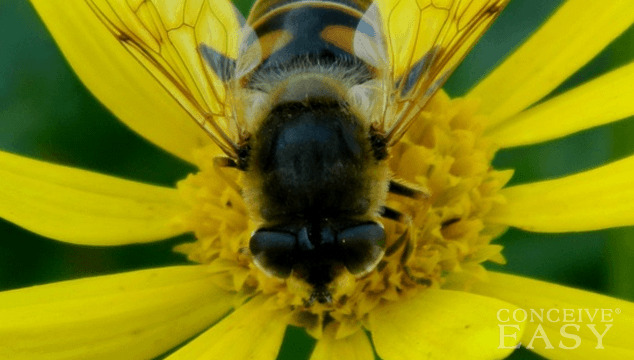 Royal Jelly is extremely high in amino acids, proteins, and other vitamins. Royal Jelly has been shown to balance hormones, since it mimics human estrogen. Royal Jelly can increase libido, support the production of healthy egg and sperm, and boost the body’s natural immune system. Worker bees collect pollen and bring it back to the hive. They pack the pollen into granules with honey or other enzymes. Bee pollen has some great properties. It contains vitamins, minerals, antioxidants, proteins and amino acids. Bee pollen has been shown to boost immunity as well as fertility in both men and women. It also has been proven to offer overall health benefits beyond just simple fertility benefits as well. Bee Pollen and Royal Jelly are usually combined and sold as a mixture. They are then marketed as a natural fertility aid. You can buy it to take as a capsule, or you can get it in the liquid form also. Many women choose the liquid form and mix it with honey. You can then add it to tea or any beverage that you would like. Many women swear by Royal Jelly and Bee Pollen for regulating hormones and also supporting egg health. Royal bee jelly for egg health is a great option – if it can help the Queen Bee produces eggs, stands to reason it may help you! Be sure if you are using Royal Jelly or Bee Pollen, however, that the sources are high quality and are very reliable. Also be sure that you never use any form of bee products if you are allergic to bees. If you are using bee products and begin to notice any adverse or negative reactions, be sure to tell your doctor immediately.